Every day more and more motorcycles can be seen on the road. And no wonder – regardless of how comfortable can be RV-ing in the luxury of a motor-home, many motorcycle bikers would rather ride on their motorcycles. After a long all day ride a good sleep would provide a great pleasure. But it doesn’t mean that you have to go to a hotel or motel. A motorcycle pop up camper can provide you some kind of comfort. For sure, you wouldn’t find there the luxury of hotel’s bathroom, or king-size bed and definitely not TV on the wall. But sounds of nature, flashing stars along the Milky Way, fresh breeze will certainly compensate for most of what you can find in most 5-stars hotels…. May be exactly for these reasons, in recent years, motorcycle pop up campers became very popular among bikers. They are pulled behind the motorcycle. However, due to their limited size and admissible weight they definitely offer fewer amenities compared to other types of towable campers. That is why motorcycle pop up campers are used rather for shorter trips or adventures in wilderness where cars are either not practical or not permitted. Most models of motorcycle pop ups include sleeping area with mattress, full or queen bed. Some models have sleeping area designed sleeping bags. Further, they include small two burner stove, cooler, table with chair or dining table with attached bench seating, storage space…. They are usually very easy to set up and usually it does not take more than few minutes to unfold them. Another great benefit of these campers is the fact that they are extremely lightweight thus making them not only easy to tow but also gas efficient. Although they are small, compared to teardrop campers, motorcycle pop up campers may provide quite comfortable sleeping and living space. You can’t expect the luxury inside these small campers but everything they offer is functional and enables biker aficionados to enjoy few days riding their beauties without having to worry where to sleep. Today there are many manufacturers of pop up campers for bikes so which one you will choose depends on your needs. Time Out trailers are some of the lightest pop ups on the market which is great if you are a motorcycle owner. These trailers can carry up to 450lbs of cargo, although be careful - the last word on that matter “belongs” to the motorcycle’s towing capacity. One of the best feature of these pop ups is that they can be quickly set up and put down. Livin Lite pop-up campers are known for not using any wood in their construction. This means that beside being lightweight, they are also very durable because there isn’t anything on them that can rot. Mini Mate is lightweight but roomy pop up camper offering enough space for storing camping gear, sleeping, changing clothes, etc. Setting-it-up is very easy as it is only a two steps process. There are many different types of pop ups for motorcycles with their pros and cons. Choosing one has to be in accordance with the needs and requirements of the travelers. The motorcycle pop up camper by Roadman is a nice little camper for traveling and staying in area campgrounds. The pop up trailer weights about two hundred and twenty-five pounds and pulls nice behind a motorcycle or a trike conversion. The newer models, like the 2005 and 2006 models have more of an upgraded interior and exterior. Still, the older models are still as nice. I stopped at a camper show once in New Mexico and they had some nice campers for bikes. These campers are available for customizing to your needs. The standard width is about three feet, which is the width of the normal handlebar span on a bike. 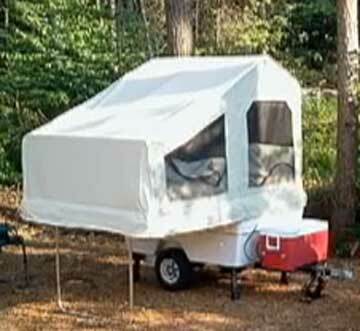 I have heard that the new Roadman motorcycle campers are coming with a screen tent with a larger sleeping area. With the new models coming out now, you can probably fine some real good deals on pop up campers from the early years for a cheap price, as people start upgrading to the newer models. I would like to travel to New York once this summer and find a camper show and see some of the newer models from all the manufactures of motorcycle campers. Because they are making the motorcycle pop up camper more spacious and adding some nice accessories, these campers make nice campers for camping and they are affordable. With so many different companies and dealers selling these campers, you can find one almost anywhere. Have motorcycle will travel and camp is what I believe the motto should be for all those guys and gals. If you think a motorcycle camper is inconvenient, you need to look at one from the inside; it is quite comfortable and does provide the outdoors camping experience. Motorcycle and camping together is another great way to explore the adventures of camping.